With East West Players’ Theatre Circle, you can get everything from season subscriptions, to VIP tickets to our Anniversary Awards Dinner — you’ll even get invites to exclusive behind-the-scenes sneak peaks for our latest productions. In addition to the Theatre Circle, the Friends of East West Players is a growing group of supporters who believe culturally-relevant arts are vital for an engaged civic community. 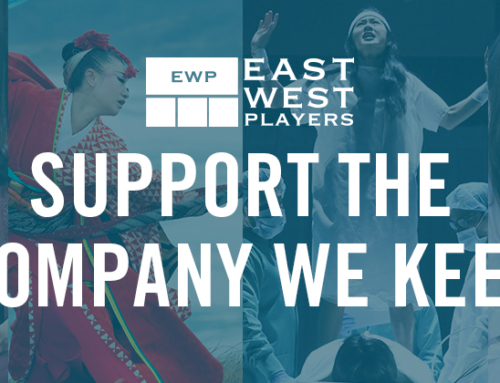 Show your lasting support of East West Players, or honor a friend or family member in a unique way with a seat in East West Players’ David Henry Hwang Theater. Make a one-time donation, and we will inscribe your name or message! A limited number of seats are still available. Plaques are 1 1/2″ x 5″ and can be inscribed with up to 30 characters, including spaces. For more information on the Theatre Circle, the Friends of East West Players, and the Seat Campaign, please contact Development Manager Dora Quach at dquach@eastwestplayers.org or (213) 625-7000 x14.